Like all Reactive frameworks/tool-kits/libraries, Vert.x is inspired by Node.js. When trying to build my first super-simple reactive (not really) application using Vert.x, I started following this tutorial from the lead developers of Vert.x. That's great stuff, but I found it a little overwhelming as the first hands-on experience. I understand that the authors are eager to highlight most of the nice features of the technology but I decided to write my own example focusing just in the very basics. The PublisherVerticle simply publishes (broadcasts) five messages using JSON as serialization and the ConsumerVerticle receives the messages and just logs their contents. The messages are just POJOs. At this point, you may wonder what a verticle is. Vert.x uses its own terminology, I recommend this post in order to get familiar with it. In simple words, a verticle is a Java class whose life-cycle is managed by a Vert.x instance and it can deploy and start other verticles, it can also communicate with other verticles using the Event Bus. And here you have the code. 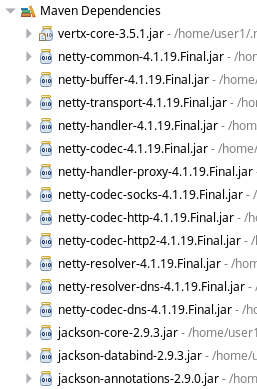 As you can see, Vert.x uses Netty for the network communication (I like that it does not force you to use HTTP only) and Jackson for JSON serialization. To run the example application you just need to execute its main class class, and looking at the output helps to understand the "everything asynchronous by default" philosophy of Vert.x. We can also confirm that Vert.x manages the pool of threads for us so we do not need to worry about it. Since this is a simplistic example, all verticles run on the same JVM/process, but one of the features of Vert.x is its convenience to implement microservices, thus, I could easily refactor the application in order to place each verticle in a different (Maven) module (and run it on its own runtime environment or in different machines) but that's subject for a future post. - communication with external services (using HTTP or simply TCP or Websockets) either directly or through the Event Bus.